Product prices and availability are accurate as of 2019-04-22 08:32:23 EDT and are subject to change. Any price and availability information displayed on http://www.amazon.com/ at the time of purchase will apply to the purchase of this product. Sigo Signs makes high quality signs that are designed to last for years without any fading. We test our products thoroughly to insure that they meet the highest quality standards. Our customer service team is on constant call to answer every concern a customer has within 24 hours. If any customer has an issue we are always happy to replace a sign and of course our signs are covered with a Money Back Guaranteed Policy. 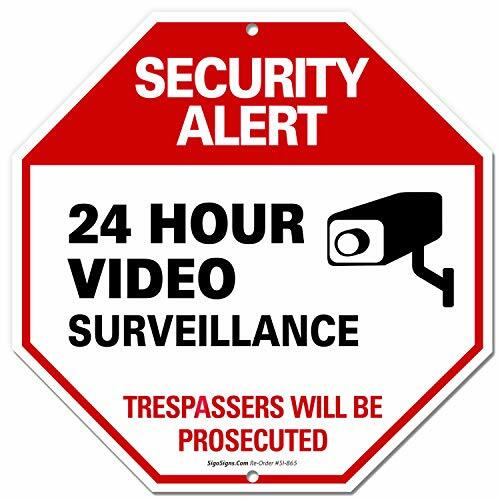 Security Alert - 24 Hour Video Surveillance - Trespassers will be prosecuted is a sign made of rust free aluminum. Its size is 12 X 12 inches. It is weather resistant and will not fade in rough weather. This security surveillance sign is very popular because of its octagon shape. Our signs are all made in the USA and ship within 24 hours to customers. VISIBLE WARNING: Our vibrant Red and Black on White Video Surveillance Sign is sure to catch the attention possible intruders. 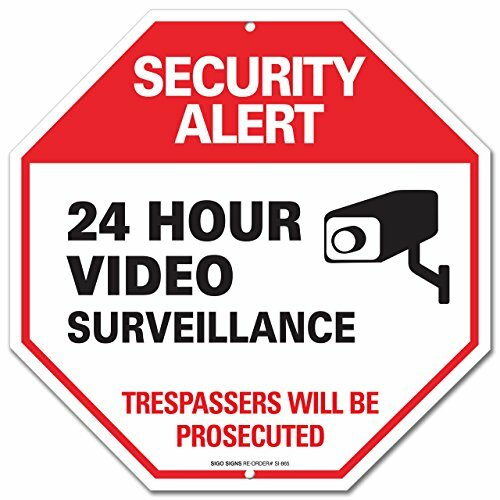 APPROPRIATE SIZE-We have carefully designed the 12x12 inch octagon size of this Video Surveillance sign considering every aspect. This unique size gives the ability for the wording to stand out and be easily understood without. MADE IN THE USA: We at Sigo Signs believe in American-made products, which is why our signs are crafted right here in the USA. UV PRINTED-That means that the graphics and wordings will withstand the elements and will not fade. 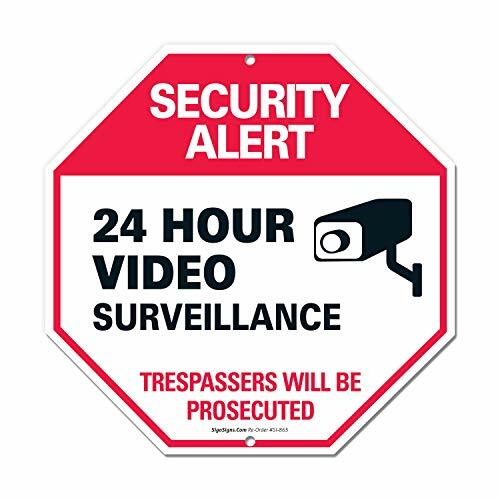 Long-term lasting HASSLE FREE MOUNTING Every Video Surveillance Sign aluminum sign has 2 pre-drilled holes and can be easily mounted on every surface. Place it easily with no need of adhesive or special equipment!